The belly attachment, in the diagram, is a variety of attachment on the side of two enemy stones. is the belly being attached to (think of the stone above as the "head"). The belly attachment can be highly effective for living, connecting, capturing, sealing in, or penetrating. 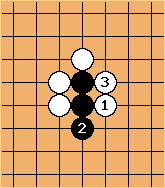 One's immediate instinct in this position is to play at a or b, both of which could indeed be vital points. 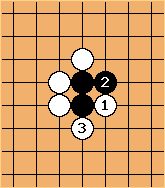 The interesting thing about is that it takes one of Black's liberties while making these two points into miai, allowing you to take whichever one your enemy doesn't, In situations where either move is useful, that makes this a powerful tesuji. White to play and connect up by capturing the two black stones in the corner. The belly attachment does the trick. See the belly attachment tesuji for more explanation. This common tesuji for sealing in your opponent is also a form of belly attachment.